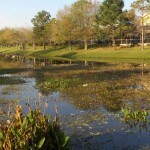 Small lakes and ponds require management just like gardens, greens, and fairways. This is particularly true for aquatic plants, ranging from simple single-celled algae to large rooted plants. 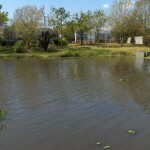 Let’s look at how we can manage various aquatic plants under different conditions and for different aesthetic needs. Phytoplankton: Single-celled plants suspended in water. They may aggregate into small colonies that are visible to the naked eye, but are usually microscopic and evident only as a green (or sometimes brownish) coloration of water. Abundant phytoplankton—and the resulting green water—is not necessarily a bad condition: it can even be beneficial when it prevents other more problematic plants from growing in the green, turbid water. 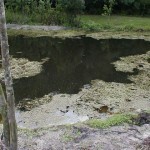 Excessively abundant phytoplankton, however , can be toxic to fish and cause foul odors and unsightly coatings of blue-green scum on the water surface. The best way to reduce phytoplankton is by reducing nutrient input levels (whether from fertilizer or other sources) into the water. Filamentous algae: Simple plants whose cells attach end-to-end to form long filaments that intertwine to form thick, unsightly mats. Like with phytoplankton, the best way to reduce their abundance is by decreasing nutrient inputs. 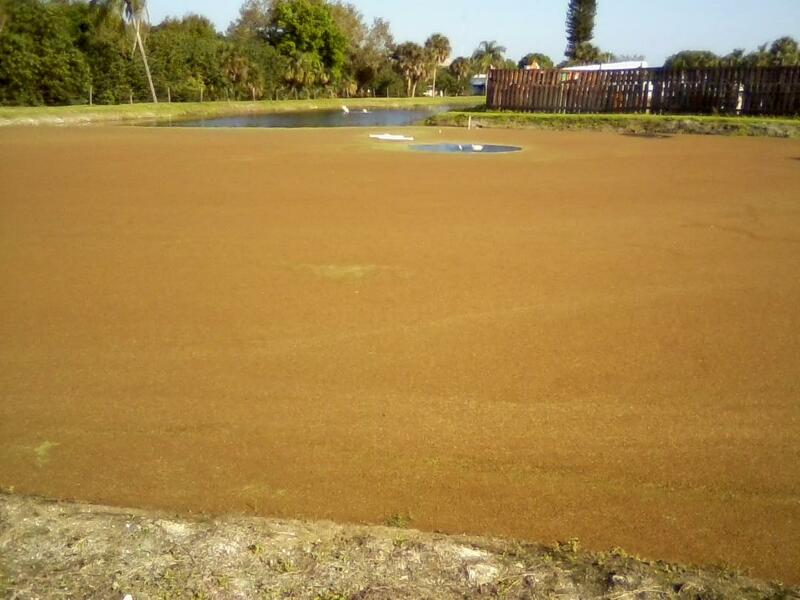 However, other methods can be effective and often are necessary, including spot treating algae mats with copper herbicides, introducing weed-eating fish such as triploid grass carp or tilapia, and adding specially manufactured pond dyes. The key is to prevent the problem from becoming too severe. Physical removal of excess filamentous algae to reduce levels can increase the efficiency and safety of algicidal or fish treatments. 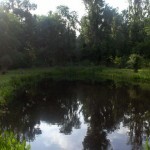 Submersed plants: Aquatic plants that root in the pond bottom while the body is suspended in the water. Some are useful for aquascaping. 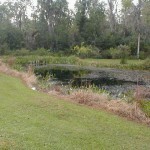 However, in small ponds they can grow to objectionable levels. 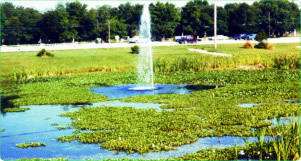 Since partial or selective control of submersed plants is difficult, it’s easier to eliminate all submersed plants in a pond. Contract herbicides or the systemic herbicide flouridone can be effective, depending on water conditions. If water flow is too great, herbicides may be ineffective. Triploid grass carp is effective at 2 to 20 fish per acre; stocking rates depend on target weeds and their density as well as other regional factors. 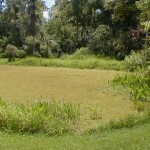 Using grass carp for weed control can be unpredictable due to fish loss from escape or predation by wading birds or alligators, and can also impact emersed vegetation. 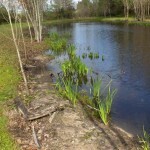 Adding or removing fish as necessary and the judicious use of herbicides will enable better management. 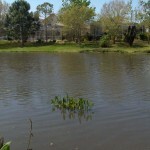 Floating plants: Plants that float on the water’s surface. 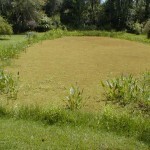 The most common problem plants are duckweeds, giant duckweeds, and watermeal. 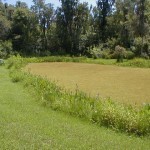 Diquat controls duckweeds but requires frequent applications. 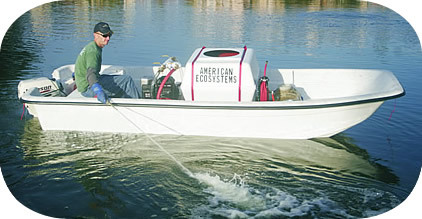 Triploid grass carp are also effective but high stocking rates are necessary. 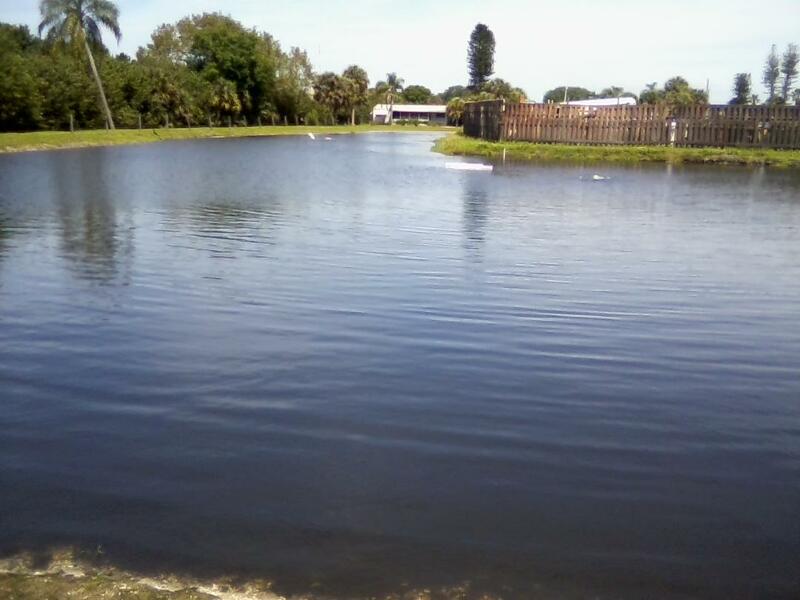 With proper conditions (minimal water exchange and no concern over sensitive non-target plants), you can achieve long-term control of floating plants (including watermeal) with flouridone. 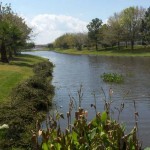 Emersed plants: Plants that root in the pond bottom and extend above, or float upon, the water’s surface. 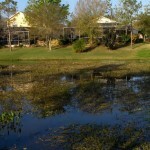 Many are important for aquascaping and wetland mitigation. 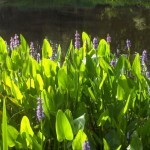 Some of the more popular ones include arrowheads, spike rushes, bulrushes, soft rush, and water lilies. 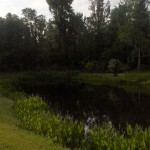 While aquascapes can be attractive and enhance landscapes, they do require more maintenance and expense than plant-free ponds since it is necessary to manage the desired plants as well as control the weedy species. 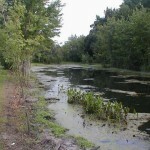 Common immersed aquatic weeds include torpedo grass, alligator weed, and pennywort. Herbicides such as Rodeo are often used; application usually has to be quite precise and requires experience, being more an art than a science. 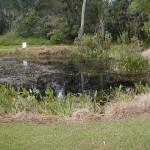 Certain immersed plants tolerate low levels of flouridone. Hand pulling is often necessary to control unwanted plants. 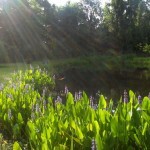 Aquatic plants can be managed in different ways, depending on your needs and the appearance you desire. 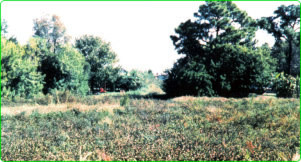 Triploid grass carp, herbicides or a combination of the two may be used. Management becomes more challenging when you selectively control some plants and not others. 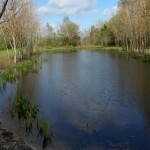 But if you are planning to aquascape, expect the enhancement to the landscape to be worthwhile. 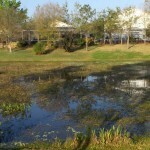 dramatic a change our service will make to your sick lake or pond.